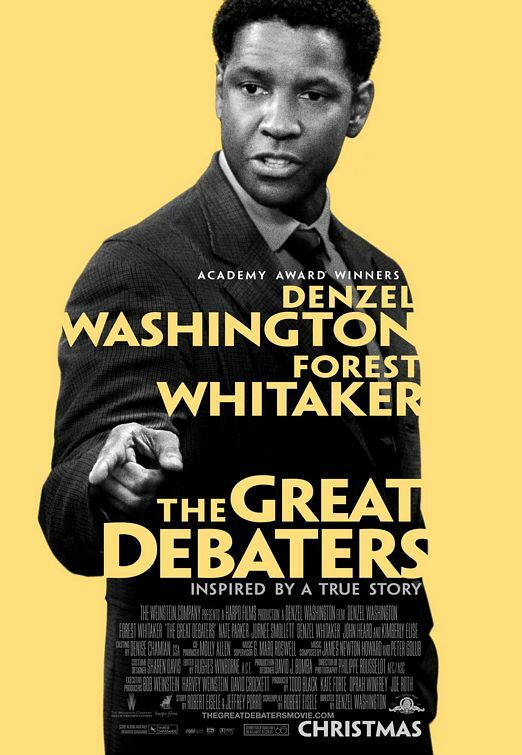 After seeing “The Great Debaters” twice before, I sat down to watch the film once again for my Western Traditions class, and saw it in a completely new light. Directed by and starring Academy Award winner Denzel Washington, and former new comers to the business, Nate Parker, Journee Smolett, and Denzel Whitaker, the film (based on a true story) sheds light on the black college debating scene in 1930’s Texas. Denzel Washington plays Melvin Tolson, the harsh, but considerate debating coach at Wiley College by day, and southern farmer’s union organizer and advocate by night. The astounding Miss Samantha Booke is played by Journee Smolett. The first and only female member of the debate team, she captures audiences with her passionate and heart-felt delivery of arguments and becomes the love interest of Henry Lowe. Lowe, played by Nate Parker, is the stubborn and outspoken leader of the group. After he is basically forced to try out for the team, we quickly see his true talent as becomes the strongest member, able to think quickly on his feet and show the inexperienced, younger ones the ropes. Denzel Whitaker, plays the young (he is only 14) James Farmer Jr., son of respected, minister James Farmer Sr., played by another Academy Award Winner Forest Whitaker. James is disciplined and eager to learn and perform. Although he starts out as the researcher for the team, by the end of the film, he is the one who helps to lead his team to victory. The team starts out debating other black colleges, easily defeating them, but they soon rise to debate some of the best in the country, catching the attention of larger all-white schools who challenge them to debates that they just as effortlessly win. They face real challenges when they witness the lynching and burning of a black person at the hands of a white hate-mob, but they channel the fear and anger they experience from this ordeal when facing their biggest challengers of all at Harvard College. The film recognizes the plight of the black college student trying to be successful during Jim Crow segregation. Although it does all this while making debate team training look like army boot camp, muddle some of the actual events that took place for this particular team, for a Hollywood movie, the filmmakers do a very good job. The film is a mild tear-jerker, and very inspiring (as most films produced by Oprah are). I left both the classroom and movie theater feeling like I should be doing more with my life when people like the main characters suffered so much so that I might have the opportunities I do. In other words, great film! This entry was posted on May 4, 2010 at 4:16 am and is filed under FILM REVIEWS, Uncategorized. You can follow any responses to this entry through the RSS 2.0 feed. You can leave a response, or trackback from your own site.